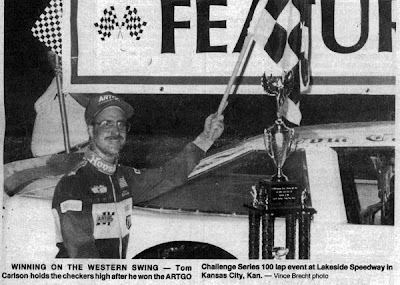 1995 – A new king of late model stock car racing was crowned September 3 at Lakeside Speedway in Kansas City, but the crown remained in the family. The Carlson brothers, Steve and Tom had made several trips from their Wisconsin homes to the half-mile paved oval with younger brother Steve ending up taking home the trophy and the prize money, but it was a different story this time. The elder Carlson used the low side to pass his brother at the start of lap 67 and then held off Jim Weber of Roseville, Minn., to win the 100-lap feature in the ARTGO Series’ “Western Swing”. Weber, Steve Carlson, Joe Shear and J.R. Roahrig rounded out the top five. 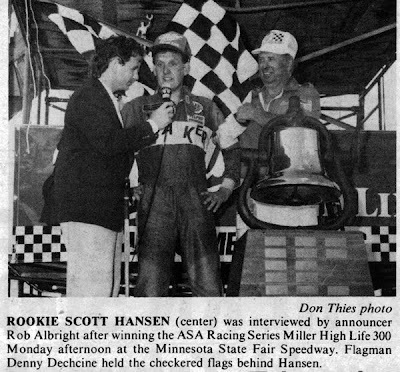 1989 – Rookie Scott Hansen earned his second ASA Racing Series victory of his career as he topped the Miller High Life 300 before a crowd of 14,000 fans on Monday afternoon, September 3, at the Minnesota State Fair. The rain-delayed race saw Mike Eddy pace the first 143 laps before pitting and giving the lead to rookie Tony Raines. Glenn Allen Jr., charged ahead of Raines six laps later. Hansen took over the top spot five circuits later and stayed there until NASCAR star Rusty Wallace took over the point on lap 195. Eddy worked his way back to the front on lap 219 but for only one trip around the half-mile paved oval. Hansen took command for good and then survived constant pressure from Bob Senneker to take the checkers by .23 of a second at the finish line. Joe Shear placed third ahead of Rich Bickle Jr., Harold Fair, Ted Musgrave, Kenny Wallace and Eddy. Hansen averaged 71.654 miles per hour in covering the race in 2 hours, 5 minutes and 36 seconds. He took home $7,900 for his efforts including $500 for leading at lap 150. 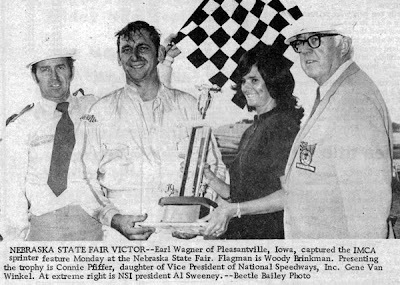 1972 – Earl Wagner of Pleasantville, Iowa, won the National Speedway Sweepstakes Monday afternoon September 4 at the Nebraska State Fair. Wagner took the lead from Larry Crambleton on the second lap and then proceeded to battle Eddie Leavitt of Kearney, Mo., for the final 23 circuits. After racing side by side, bumper to bumper, Leavitt managed to power by Wagner on lap 20 but a persistent Wagner came back to grab the top spot two laps later and held on for the remaining three go-rounds. Wagner pocketed $500 for the feature victory. Leavitt, Chuck Amati of Greenfield, Tenn., Dave Ross of Jetmore, Kan., and Ralph Parkinson of Wichita Falls, Tex., rounded out the top five. 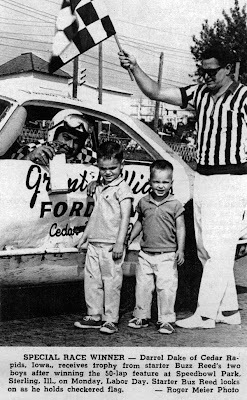 1967 – Darrell Dake of Cedar Rapids, Iowa scored the win in the special 50-lap Labor Day Invitational at Speedbowl Park in Sterling, Ill., on Monday afternoon, September 4. Dake, who started in the third position, took the lead of the 24-car field on lap 33 from Rock Island’s Benny Hofer. Dake had no problems from there, winning by a comfortable margin. Verlin Eaker, the speed merchant from Cedar Rapids, finished second followed by fast qualifier Lloyd Ewing of Peoria, Ill. Benny Hofer took fourth followed by Jim Gerber of Davenport, Iowa. Thanks again you two for going to this work to put up all this old information. I enjoy reading it.